Smile repair may be necessary despite the best efforts to keep patients’ smiles whole and healthy. At Pleasant Grove Family Dentistry, we offer a wide array of restorative dentistry solutions that repair the form and function of damaged teeth while preserving the maximum amount of healthy dental structure. Contact our team as soon as you experience toothache or dental damage. We’ll schedule an appointment as soon as possible, on the same day in some cases, and help you restore your damaged smiles. We welcome patients from Texarkana, Nash, and other nearby communities. Dental crowns are commonly used to repair damaged teeth and as part of fixed bridge and dental implant tooth replacement. These restorations look like natural teeth, but they are actually caps that fit over the top of a damaged tooth or connect to implant posts. 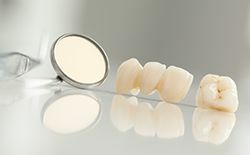 We offer custom dental crowns in a variety of materials to meet any patient need. Tooth decay is one of the most common dental ailments experienced, and most adults are no strangers to cavities. You might be asking yourself, why would a filling be a cosmetic dentistry procedure? Amazing advancements in the field have made amalgam (mercury bonded to other metal) fillings a thing of the past. Today, tooth-colored fillings made of composite resin materials have a natural look and have replaced the need for dark fillings. The process is simple and can be completed easily in just one appointment. The composite resin material is applied directly to the damaged tooth, shaped into position to restore lost structure, and hardened using a curing light. In addition to offering fast, effective correction for mild decay and dental damage, tooth-colored filling material can be used to conceal cosmetic flaws such as gaps and stains in just one visit, saving patients time and money compared with other cosmetic treatments. Patients with extensive tooth loss will need to consider partial and full dentures. 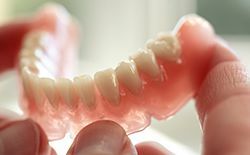 Partial dentures, often referred to simply as partials, are crafted by creating a gum-colored base that is shaped to fit between remaining healthy teeth and snap into position with metal clasps or brackets that are connected to surrounding teeth. Replacement teeth are then attached to the gum-colored base to restore the missing dental structure and prevent the shifting of teeth out of alignment and restore full chewing ability. 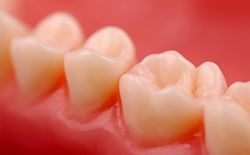 Full dentures are similarly crafted by attaching a bridge of replacement teeth to a gum colored base. However, dentures replace an entire row of teeth which means they cannot be supported by remaining teeth. Instead, the base is molded to fit snuggly against the gums creating suction that holds the denture in position. Patients interested in a more stable solution may want to consider dental implant supported dentures. Root canals are performed when patients experience decay or damage that reaches the innermost layer of the tooth known as the pulp. The entire nerve system of the tooth is housed within this layer of pulp. When decay allows the nerve to be directly accessed, the result is a severe toothache. Root canals are a simple procedure that relieves these painful toothaches by removing the damaged tissue. We start by drilling a small hole through the top of the tooth. We then extract the damaged pulp through the access hole. The tooth is refilled with a biocompatible substance, and the hole is resealed. In most cases, we recommend placing a dental crown to protect the treated tooth from further damage.